It seems there is a "triple whammy" going on in some of the housing bubble states. Let's focus on California as a typical example. Housing is slumping, foreclosures are soaring, and consumer confidence in the economy is sinking fast. Californians' consumer confidence in the economy took a dive in the second quarter of 2007, plunging into the pool of pessimism by 19 index points. Economist Esmael Adibi called the drop "astonishing" - the steepest he's seen since 2002 when Chapman University's Gary Anderson Center for Economic Research of Orange County began sending surveys to California residents. "There could be even more of a slump in the next quarter," Adibi said, as the survey of California residents reflects diminished enthusiasm on the part of consumers in the state to buy big-ticket items over the next six months. The 19-point drop, from 101.9 down to 82.8, is considered significant because the consumer confidence index hasn't dropped this sharply since 2002 when the state budget was in flux. And that has people trying to hold onto more of the money they have - uncertain what tomorrow may bring. I find the above interesting (with thanks to "Linda" for sending me the article) even as I have written in the past that I see little correlation between what consumers are saying and what they are actually doing or for that matter how the market is responding. Please see Leading Economic Indicators for an explanation. That link shows that the stock market and consumer sentiment are questionable (at best) leading indicators. Nonetheless let's take a look at a chart of California sentiment. Actually it makes sense for consumer sentiment to be resilient. Time and time again, with thanks to ever increasing bubble blowing by the Fed... businesses then consumers then businesses have been temporarily bailed out by inflationary policies. The key word in that last sentence is temporarily. All that has really happened is a postponement in the day of reckoning. 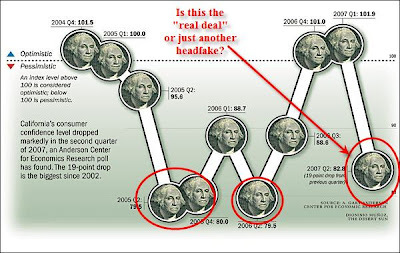 Unlike most others I believe there is a practical limit on the ability for the Fed to inflate. The game will be over when consumers are more willing to pay off (or default on) existing debt as opposed to taking on additional debt. For more discussion on the above idea please see an Interview with Paul Kasriel. But let's return to the lead article for a second. The key sentence was easy to miss: "People are trying to hold onto more of the money they have - uncertain what tomorrow may bring." Bingo! The time preference of consumers is changing slowly but surely. That is crucial given that consumer spending constitutes approximately 70% of the economy. Although it is not possible to say when this will matter It will be a prolonged change in consumer psychology and time preference that affects the market, rather than a prolonged change in the market that affects consumer psychology and time preference. Jeffrey Cooper was talking about psychology yesterday in Wiley Complacency. A wise trader once told me crashes don’t come from too much bullishness, they come from too much complacency. Recently I read that after the sharp three-day, 50 point S&P sell-off into June 7th (during which there was an atrocious advance/decline figure of 1 to 3.1), that a sentiment survey called “The Daily Sentiment Indicator” had reported that 88% of traders were still bullish. I am told by those in the know that in twenty-five years that no such reading had ever before occurred. In other words, prior declines of such amplitude drummed up some fear. Not this time around. ... I am told the recent four-week 60 basis point rise in ten year yields is equivalent to a one-thousand point decline in the DJIA. I know the litany – a bull market climbs a wall of worry. The market discounts – it knows all of the above and still in its omnipotent wisdom chooses to go higher, etc, etc. So, the level of bullishness even in the face of ugly internals is not surprising. How can it be that traders continue to wrap themselves in robes of Teflon momentum shrugging off all the slings and arrows in their way? Simple. They can because it has paid to do so. It has paid to ignore any and all concerns. But, walls of worry don’t grow to the sky. Brick by brick the bad habits that pass for reasonable risk taking get mortared at the clay feet of Emperor Complacency’s riskless robes. Floridians were camping out overnight in lines to buy Florida condos. Prices were soaring. Did prices start falling or did the pool of fools willing to buy Florida condos at increasingly absurd prices dry up first? Will stock prices drop first or will the pool of fools willing to finance increasingly absurd leveraged buyout deals and debt financed stock buybacks dry up first? I suggest history is about to repeat. The above post appeared earlier today on Minyanville. About a half hour later I noticed this headline: GALLUP: 7 in 10 Americans Say Economy Is 'Getting Worse'. The stock market may be climbing and the unemployment remains relatively low, but 7 in 10 Americans believe the economy is getting worse -- the most negative reading in nearly six years.